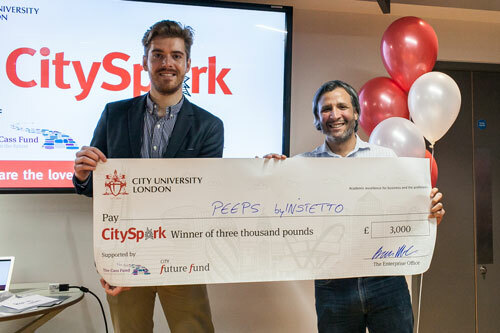 The winners of the second round of City University London’s enterprise and innovation competition have been selected at the CitySpark final. 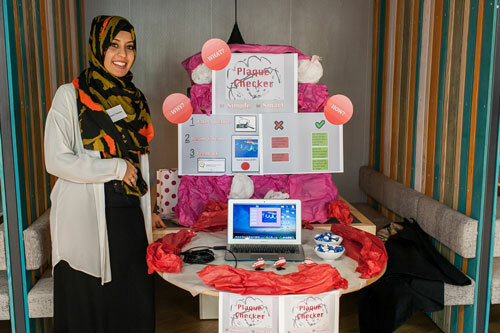 From more than 60 entries, the best 15 were selected to take part in the CitySpark marketplace, where the students and recent alumni hosted stalls promoting their concept to judges. Made up of business experts, entrepreneurs, alumni and City staff, the panel of judges voted for the teams they felt had the most innovative, well-designed and sustainable business ideas. The five teams with the most votes each took home £3,000 and a place on the FastForward (FFWD) Accelerator programme. Designed by City University London and the Accelerator Academy, FWWD is an interactive six week programme that covers topics from technology and marketing to finance, with the help of industry experts and mentors. 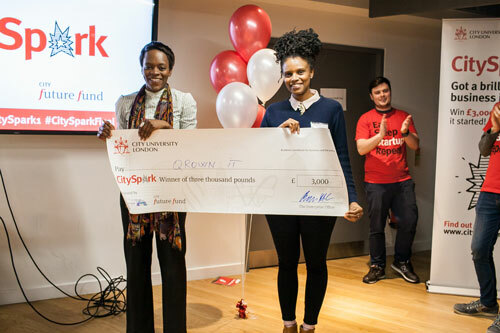 CitySpark aims to help City students and recent graduates to understand the process of moving from an idea to a viable, scalable business venture. 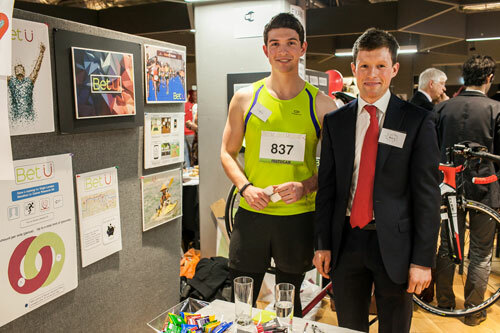 This year’s competition saw a record number of entries, with the number of applications more than double this time last year. Olorunfemi said: “We came up with the idea because my friends and I routinely have problems finding a salon. The idea of connecting people technologically in this day and age seems like a rational solution to this problem. “The idea popped into my head when my sister was told to keep track of the health of her gums in order to have a brace fitted, but was finding it hard to monitor them when she was away from the dentist. Christoffer said: “The idea came from watching people clumsily trying to network, spelling their name letter by letter and at some points giving away their phone to make sure they had the details right. I thought there has to be a better way of exchanging details. “My brother and I came up with the idea whilst cycling from London to Gibralter. Thinking about the charity we were fundraising for was one of the things that kept us going but we were frustrated and surprised that there weren’t more ways to share what we were going through to make our fundraising efforts more interactive. After a particularly tough day we struck upon the idea to connect challengers and supporters with an app that makes fundraising more fun, exciting, immersive and effective. "When it was announced that Bet U was a winner, we were gobsmacked! It was the most brilliant feeling to know that our idea had been validated by the judges, that all of our hard work and long hours had been worth it and that we would have the opportunity to develop Bet U further through the amazing resources and help of the CitySpark competition. The idea: Going behind the headlines with an interactive guide to current issues. “I've worked in the journalism industry for a couple of years and gradually got more and more frustrated at the lack of innovation in how journalism is displayed to the audience. I also felt we weren't "teaching" as much as we should be, which means readers often feel overwhelmed with information that hasn't been explained. So I set out to solve it - hence Explaain.com! "CitySpark forced me to think more about Explaain's viability as a business, and how to effectively communicate the message. I've also been based in CityStarter's The Hangout since December, which has been incredibly helpful! 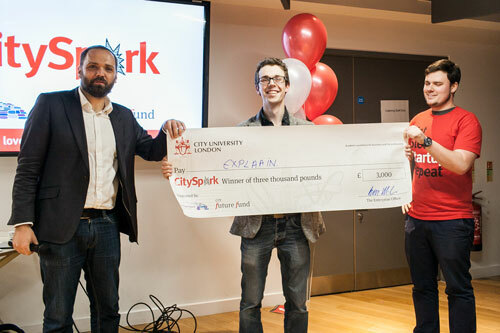 CitySpark is a business design and doing competition that helps City University London students and recent alumni to develop a business idea, test it out with potential customers and then make it happen.